One of the obvious things about a game is that it’s fundamentally an abstraction – something that stands to represent, but not precisely simulate, some other endeavour in some other realm of activity. Abstraction is an interesting concept because it is so malleable. Memoir 44 abstracts the Second World War down into unit based battles decided by die rolls and strategic execution of orders within constraints. Twilight Struggle as a counterexample abstracts the Vietnam War into a single card with geopolitical impact on the world stage. One of the most difficult things to do in any task of abstraction is to pick the right level of granularity – to find the sweet spot where you have the maximum leverage to accomplish what needs to be done with minimal fuss. In many ways, correctly picking your level of abstraction is the most important thing you’ll ever do in designing any kind of formal system. Imagine my joy then to find Fresco. This is a game that has decided its abstraction absolutely had to include a model of the soul-searing angst that is associated with getting up early in the morning. I thought this day would never come. This game was made by someone who just gets me. Seriously. This game just gets me. 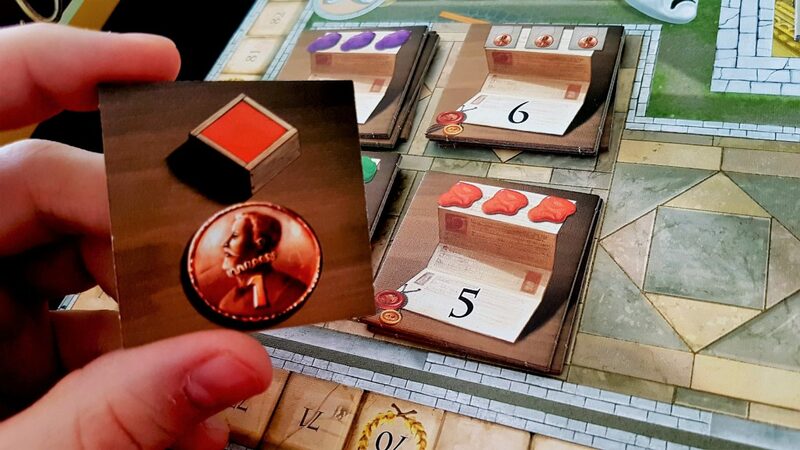 In Fresco, each of the players takes on the role of – well, I’m not entirely sure. It seems very much like you’re the tyrannical overlord of some kind of renaissance-era factory unironically mass producing soulless works of ecclesiastical devotion. You stand atop a pyramid of pigments, having control over three master painters and a small army of apprentices who do your bidding. Together, they do all of the work so you can get all of the credit. It’s a bit like you’re playing a board-game based on the cynical market practices of Damien Hirst. You’re the boss here. You’re drinking wine with the bishop, extoling together the virtues of ascetic introspection and the divine. Your staff are toiling away over the painstaking work of fresco renovation. You’re staggering off to bed in the wee hours to prep yourself for a killer hangover. At that very moment your apprentices are rising, bleary eyed, from their three hours of sleep to go stand in a chilly market square waiting for the next paint delivery. You’re counting the coins from your latest art auction. Your apprentices are wearily mixing paints and wistfully daydreaming about finding replacement work as trainee dung-tasters. 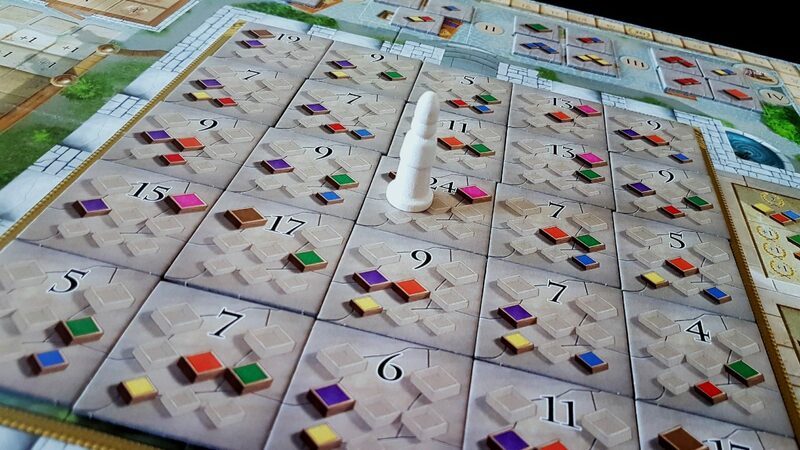 Fresco is simultaneously a game of paint management and a scathing indictment on mass-produced art. It’s Marx’s theory of alienation represented in cardboard and wood. I mean, look at that board. Just look at it. It’s like a child’s spreadsheet developed by a collaboration between the Communist Party and the Catholic Church. Eternal salvation, sponsored by Dulux. Right, enough of that. Let’s talk GAMEPLAY. 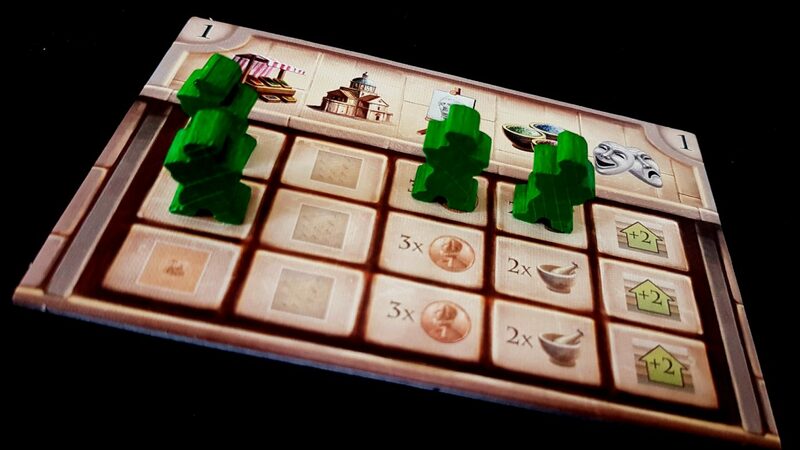 On the face of it, Fresco looks like a game of worker placement. It isn’t really. It’s a game of worker scheduling, and that’s a subtly different activity. It feels a bit like an engine builder, but it isn’t really. It’s more about the fuel than it is about the fire. It looks a bit like a set collection game, but it’s not that either. Really, Fresco is a game of seizing opportunity, and employing an element of logistical alchemy to convert and refine those opportunities as they progress along a temporal pipeline. 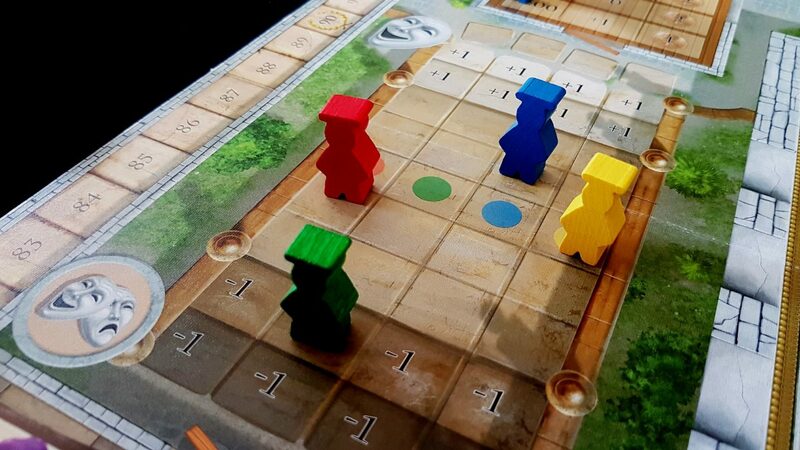 Fresco is a game that is very much about planning ahead. If you can do that well, you’ll reap rewards. If you don’t, it’ll still be fine. I’m sure the Bishop’s eternal lamentations about your fecklessness won’t be that big a problem, really. 5am? That’s a typo, right? Each round, you and all your other overlords decide on the order in which your apprentices are going to wake up and tackle the day. 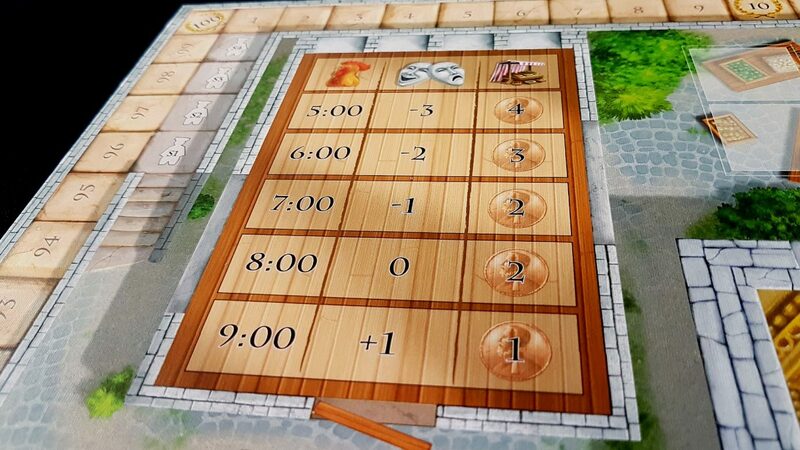 The scoring track that goes around the board shows the schedule of activity – the players choose their wakeup time in the reverse order of their accomplishments. There is a powerful benefit associated with being last on the track and first to decide. You get to set the tempo of the day, and that is powerful in Fresco because it’s a game about balancing the cost of enthusiasm versus the benefits of lethargy. The player that goes first gets the choicest, juiciest options of all the action that follows. The earlier your apprentices rise though, the fouler their mood and the more costly paints are to purchase. Paints in Fresco are a bit like cuts of meat in a butcher’s window – you pay extra for freshness. This is clearly paint of dubious quality if it can’t hold its value during the day. The mood impact of an early rise is to adjust the morale of your studio – if morale is high, you get access to a temporary neutral apprentice that gives you an extra action. If it’s low, one of your own apprentices sulks off to bed in a massive huff and you can’t assign them to duties until you cut your staff a bit of slack. Seriously, what’s wrong with you? Getting up early is the worst, and Fresco is already a game that considers an 8am start to be a sybaritically luxurious lie-in. I mean, c’mon – by 8am in the morning I’ve barely managed to stop screaming. If I were one of these apprentices you’d be lucky I wasn’t calling for strike action and arranging a mass sit-in. Let’s say though you’ve hauled your poor little apprentices out of bed and hurled them out into the cold black of a chilly winter morning. To what end? Why are you doing this, you monster? There are five actions to which you can assign apprentices during the course of the day, and these are done in a fixed order. Depending on the mood of your studio, you’ll be able to do between four and six of these, and potentially repeat any given action up to three times. First of all, anyone that assigned apprentices to the market gets to buy paint at the cost their wake-up time dictates. The earlier you get up, the more likely you’ll get the specific paints you want. You’ll pay a premium, but you can’t put a price on having the right shade back in the warehouse. Actually, you can – anything short of a nine o’clock start is too high a price. I mean, seriously. Who could live like this? Everyone fully resolves their market phase before moving on to the next order of business. If you’re at the back of the queue you might find yourself trying to make do with a few squeezings of a colour you didn’t really want. Or, if you’re playing against some especially nasty bastards you might find that they decide, in lieu of buying paint, to shut down a market stall. Just – trash it completely so nobody that follows can buy anything. ‘WHAT DO YOU MEAN YOU DON’T HAVE ANY GREEN?’, they yell, and then go to town on the marketplace like they’re backstage with the Who. Anyone that trails in afterwards is left morosely sweeping up flakes of dried pigment in the hope they can fool the bishop with some coloured water instead of actual paint. Yeah, sometimes you might want to pay the exaggerated costs just to make sure you’ve got the colours you need for what follows. Throwing shade in Fresco is a literal activity. Next is the Cathedral phase, and anyone that assigned apprentices here can cash in paints they have in stock for fresco pieces. They can also toss a coin the bishop’s way to move him closer to a part of the Fresco he might actually see. Proximity to the bishop is worth extra points, because it’s not enough to do, one must also be seen to do. Every piece of fresco you restore counts for its face value in terms of victory, but it’s also a coin of income that comes your way at the end of the round. He looks a little bit rude. 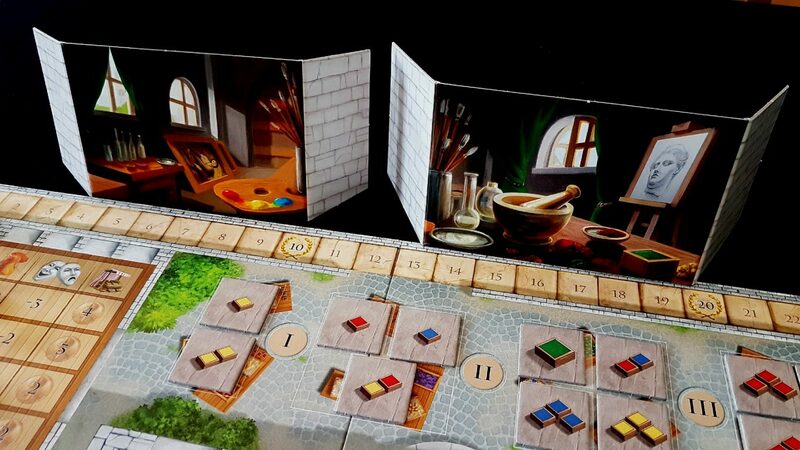 And here’s where we see the first of the real logistical issues at the core of Fresco – each piece of the display needs a particular combination of colours, and you spend the cubes of the appropriate colour to collect it. 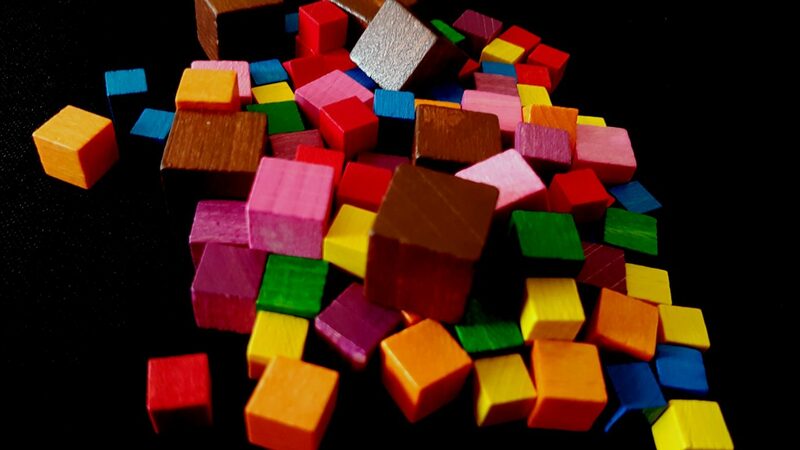 Usually though you’re going to need something more than primary colours – you’ll need to blend paints, and blend blends together until you get exactly the right combination of cubes to pick up the more lucrative options. The market helps there, sometimes, but mostly what you get from a trip to the market is a handful of primary colours and a profound sense of aggrieved persecution. Often you’ll traipse into the cathedral only to look forlornly at what’s on offer. You’ll be left to say ‘Sorry guv, we’d love to do you a fresco today but we’re waiting on a part. We can maybe do Tuesday’. However, for those that come to the house of God unprepared, there’s always an option to do up the altar with a set of primary or secondary coloured paints. It’s the equivalent of staring around with a cigarette dangling from your mouth and saying ‘Yeah, Tuesday. Mind you, that altar is looking a bit shabby, innit? Tell you what guv, I’ll give it a touch up for fifty quid. Cash in hand, mind’. You only get a dribble of points for that, but it’s better than nothing. Maybe. Except it probably isn’t. Oh god. We’ll get to that. After the cathedral, your apprentices trudge dutifully to the art studio to do portraits. Here you can pick one of the special cards available (some offering instant boosts, others permanent upgrades) or you can just do some idle painting for three shiny coins. Oh, not for the apprentices – no, that money comes straight back to you. Those oiks would only spend their earnings on mince pies and whippets – best that you look after all that complicated money stuff. And then it’s on to the workshop to mix paints. Yes! See, you’re not dependent on the marketplace for the shades you need, but you only get to mix paints after you’ve been to the cathedral. Here, you want your apprentices to arrive in a very precise organisational state. You want them to arrive with the paint colours they’ll need to make secondary and tertiary colours. That depends on the market and not splurging paints on a quick touch-up of the altar. You want them to arrive in sufficient quantities to mix paints in the amount you need. Each apprentice can mix two paints per action, so if you need four paints you need the right colours and two apprentices assigned. That by itself might mean you can’t commit yourself to enough market activity to get what you need. Oh god. Oh god. You want to be left with the paints you’ll want for your next cathedral action, because you can’t rely on picking up what you might otherwise need at the market. Are you going to mix your only blue? Is that sensible? Do you need it for the fresco? Is everyone short of blue? How much competition will there be for any blue in the market? Maybe you want to rethink that course of action? And then! You’re not doing this for the state of the cathedral or market as they are, but as they will be in the next turn. And you don’t necessarily get to play a major role in how they’re going to be configured by the time you get to act. If the workshop phase of Fresco immediately preceded the cathedral, this would be a game shorn of all its tension and energy. It would be the definition of cube pushing tedium, converting cubes of two colours into a cube of a different colour. The fact that it happens before you even know the wake up order in the next turn is profoundly impactful and lends so much weight to that decision. If you get to act early you can grab that 5am wakeup square before everyone else. You could guarantee you get to carry out your plans, maybe! But how much can you bank on that? What happens if you go for 5am and everyone else is at 9, 8 and 7 – you might take a mood and cost hit you didn’t need to take. So maybe you should go for six, because surely nobody else needs the first mover advantage that much? If you need three paints, the difference between a six and five wakeup time is three coins. That’s a whole portrait’s worth. Arriving at the workshop with what you need, and leaving with what you want – aye, that’s a skill and a half. I expect other kinds of requests from a bishop. But there’s more! If you’ve restored three fresco pieces, you can cash these in for marks of the bishop’s favour, and these give you a regular income of paint and money. You’ll need to lose the income from the fresco pieces themselves to claim these, but they’re also worth a serious wodge of points in addition to the steady supply of desirable paints. There’s one more action available. Finally, apprentices with an indulgent master might trudge to some tedious performance at the theatre, which boosts their mood a little before the grind of the next day begins. These must be some amazing plays to take the sting out of a 5AM start. Oh, but there’s something I didn’t mention. All of the planning and scheduling of your apprentices is done in secret, and all the paints you’ve accumulated over the course of the day are secreted away behind one of your two player screens. You’re all deciding who is going where, and in what numbers, simultaneously and with no knowledge of what each other is up to. Mmmmm. At the point everyone has decided what’s going on, you all reveal your personal allocation of apprentices and start frantically computing through the implications of what you’ve seen versus who gets to act when. Knowing that someone is heading off in vast numbers to the marketplace is interesting. Knowing they’re doing that before you can be devastating. When you see someone allocate three apprentices to the cathedral you know that either they’re going to scoop up dozens of points or have the worst day in church of their lives. Remember, every single tin of paint they buy is one you won’t have. Every single fresco piece they restore is one that you can’t. Every time they move the bishop in one direction, they’re likely moving him one space farther away from where you need him. You might only know you’ve made a lasting, horrible mistake when you see the grin on the lips of your opponent, and by then it’s too late. You’re committed. On the other hand, they’re committed too and it can be joyful to watch that grin turn to a scowl as they realise they don’t have the paints they need, or that someone else is probably going to get that lucrative fresco tile they’ve been eying up for a solid ten minutes. At the end of the round, everyone claims their income from fresco pieces and bishop requests. The marketplace is replenished from the sinister black bag that represents unpredictable market forces, and the portraits are replaced from the deck. And then it all starts again! And again! AND AGAIN! 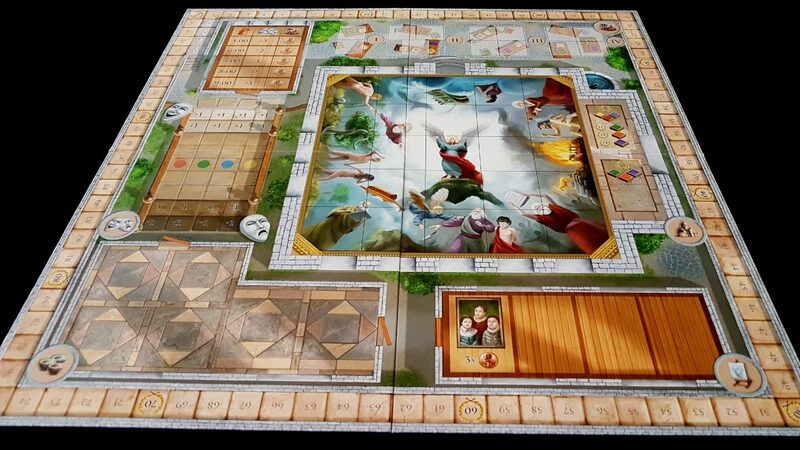 At some point, when the fresco has fewer than six pieces left to restore, everyone flips over their player board to the second side and the last round begins. Here there another three cathedral actions available to replace the theatre actions. This represents, one must assume, the master painters looking at the calendar and realising that it’s the day they claimed they’d be done with the whole endeavour. When it was the last day of school, we sometimes got to take in board games to play. The last day at Painting School is the hardest of grinds against the tightest of deadlines. If you don’t like it, then you can bugger off back to the gutters where we found you. There’s a queue of talented artists stretching around the block to take your place. When you eventually die at your easel, we’ll swap you out like a faulty cog in a malfunctioning watch. You’re just a tiny part in a much larger machine, buddy. Now go paint that fresco before you spend the rest of the evening trying to claw your way out of a makeshift shallow grave. These are all very simple systems, each of which just nudges a few counters around a board in entirely deterministic ways. And yet, they work together because every single part of the game is slightly, and obviously intentionally, out of sync. It’s like having an engine where everything is misaligned and yet it’s all misaligned enough that it works regardless. You don’t mix the paints before you use them. You often use them before you get a chance to mix them. You nudge your mood upwards with the theatre only to find yourself needing to trash it with the turn order. You find every single mistaken action results in the whole machine stuttering and spluttering and driving you off of a cliff. Fresco is a game of being where you need to be, every time you need to be there, when nobody will tell you the destination or the schedule. And yet it’s also a game that is accommodating and generous. Fully aligning your goals and actions is like stepping on the accelerator of a sports car – you’ll whizz around the scoring track at breakneck speeds. 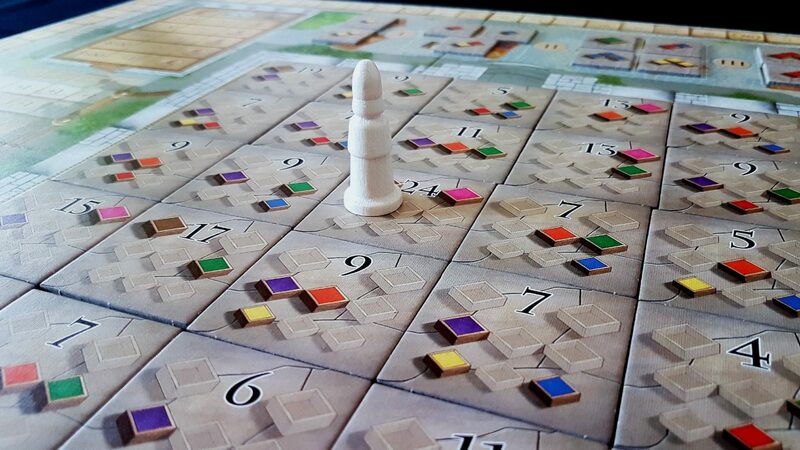 A single tile in fresco can be worth as many as twenty four points, and if you have the right options available at the right times, and you have the foresight to schedule them correctly, you will profit from the often intense contemplation that was required to make it happen. What was that? I can’t hear you over the sound of these nineteen points. And yet, that rapid acceleration sacrifices mileage for speed – you use up a lot of fuel in completing fresco tiles. Shooting ahead by forty points in a turn is great, but what happens the turn after that? Remember, when you’re first on the scoring track you’re last to set the wake-up time. What happens when you’re being forced to take indulgent long lies while everyone else plunders the market of its riches? Sure, your apprentices might love you but it’s the bishop you’re looking to impress. Having six actions available is scant comfort when none of them are what you want to do. Efficiency then is important, but so too is flexibility. 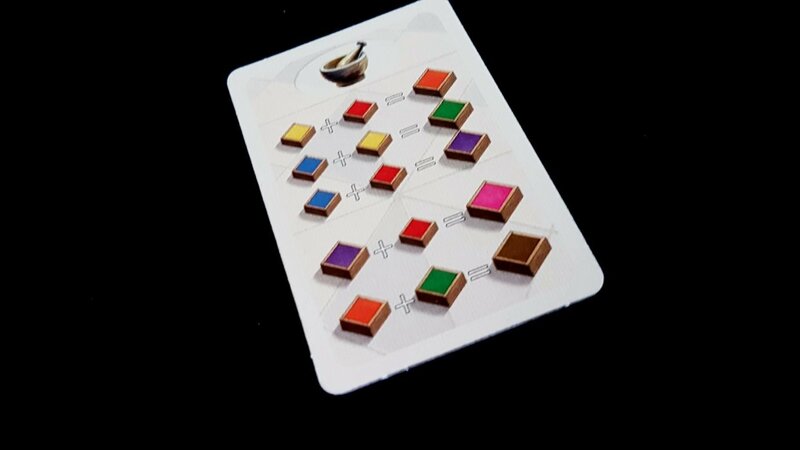 You can win Fresco by playing very ambitiously, and wringing every last point out of every last pigment. You can play deep and win. You can also play wide and win, sacrificing the optimal move for the convenient one. So what if all you do this round is buy leftover paints (at a coin per paint, so why the hell not?) and mix up new shades? So what if you have no idea what the fresco will need by the time you get to the cathedral? That only matters for those focusing on the logistics of their warehouses. You’ve got unlimited space to store your paints, so why not focus on getting lots of all kinds? That way when you arrive at the cathedral you can shrug and ask ‘Where do you need me, guv?’ instead of throwing a tantrum because the only section you could do was completed during the night by a competitor. 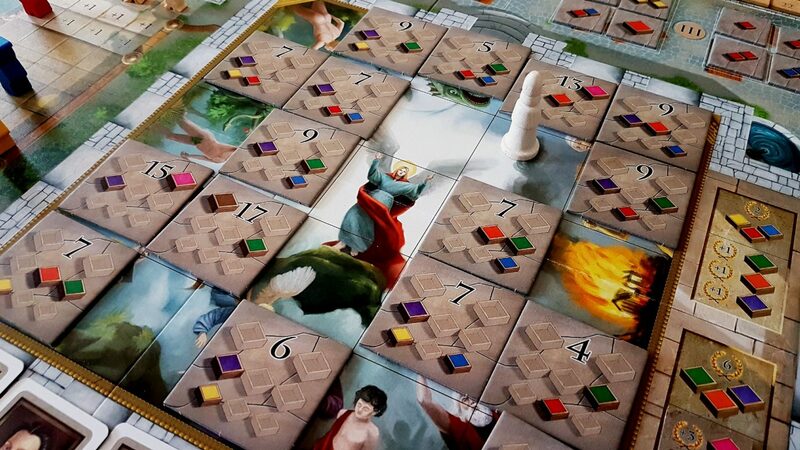 Fresco then is a game that lets you play for dominance and play for fun, and somehow manages to (usually) keep everyone involved until the end. That’s quite the trick, and it’s fitting for a game about mixing paints that it manages to harmoniously blend these styles in a way that keeps things fresh. The opportunities presented by skilful play are offset in large part by the risks, and the flexibility of conservative play is buttressed by steady, if unremarkable, progress. As a note, in this review I’ve spoken about things like portrait cards, the bishop requests, and shown the fresco with the largest array of colours. These three things are part of the three ‘expansion modules’ included in the box. My recommendation is to play with these right from the start – you spend just as much time working out which components are used in the vanilla game as you do learning the relatively straightforward expansion rules. I’ve played it in both forms though, and it is unquestionably better with the expansion modules. I like Fresco a lot – a lot more than I thought I would. 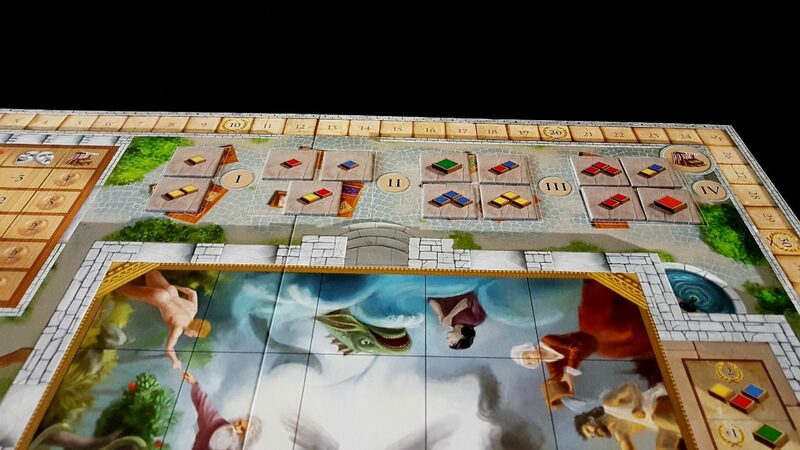 I always sigh a little when I see what looks to be an identikit Eurogame driven by pushing and converting cubes, and Fresco didn’t initially fill me with a lot of enthusiasm. At the end of the first game I thought ‘yeah, that was fine’. At the end of the second, I thought ‘that was good’. From that point on, with the expansion modules included, my appreciation grew. There are elements of mechanical precision and immaculate timing. And these are given new rhythm and emphasis by the judicious application of elasticity in the tempo. Normally seeing an engine held together by rubber bands would be a sign that something has gone horribly wrong. It works very well here, like taking two opposite colours and merging them into a harmonious blend. We’re not getting through this review without a ‘but’ though. Fresco absolute stands up to criticism and investigation and emerges as a title worthy of play in its own right. The problem for me though is that fundamentally it’s a game of cashing in coloured cubes for other coloured cubes, and then cashing those coloured cubes in for points. I already have a game that excels in that capacity – Lords of Waterdeep. I think the baseline game of Fresco is as good, and perhaps even better, than Lords of Waterdeep. I think though Lords of Waterdeep with the Scoundrels of Skullport expansion blows Fresco out of the water. Fresco though does have qualities that mean in a straight up fight it doesn’t necessarily come out a loser. The D&D theme of Waterdeep is obviously impossibly nerdy, and the infantilising objectification of the women in the art can be off-putting. Fresco’s theme is more distinctive, and executed more competently. Fresco feels like a game of mixing paints and restoring art. Lords of Waterdeep feels like pushing cubes around a board. 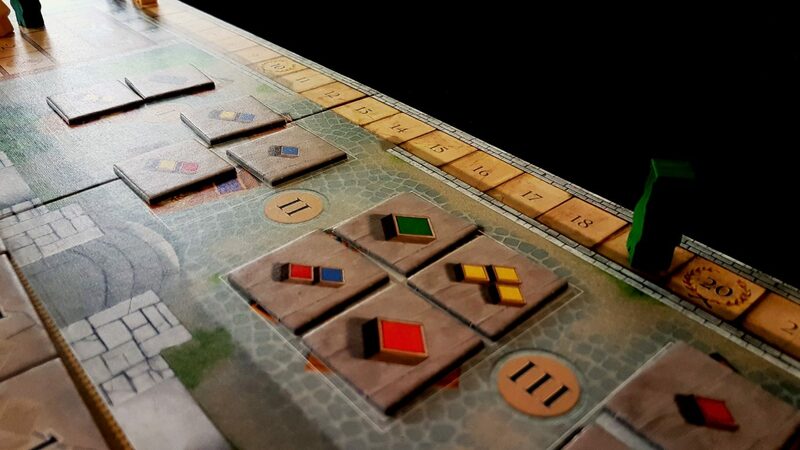 Fresco’s theme is simultaneously more broadly approachable and more effectively integrated into the mechanics. It’s also meaningfully simpler than Lords of Waterdeep + Expansion. 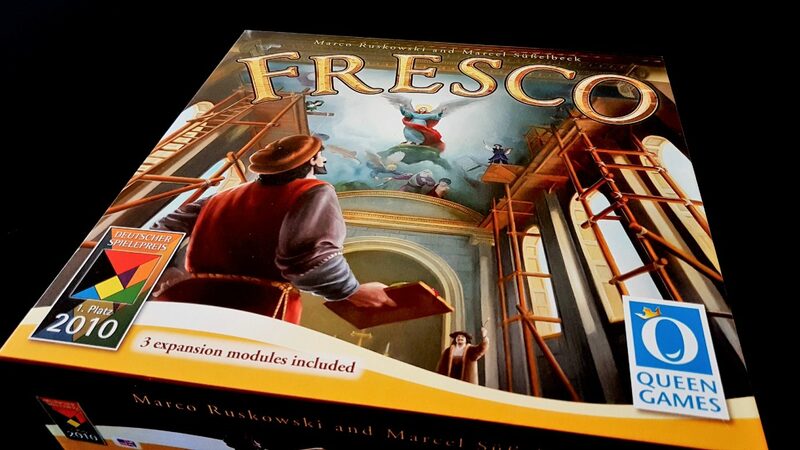 If I were looking for a game to recommend as someone’s first introduction to this style of play, I think Fresco would be hard to beat. Lords of Waterdeep (with the expansion) permits for deeper strategy and tactical engagement, but that in turn makes it a game where familiarity is hard to control for in groups of mixed ability. 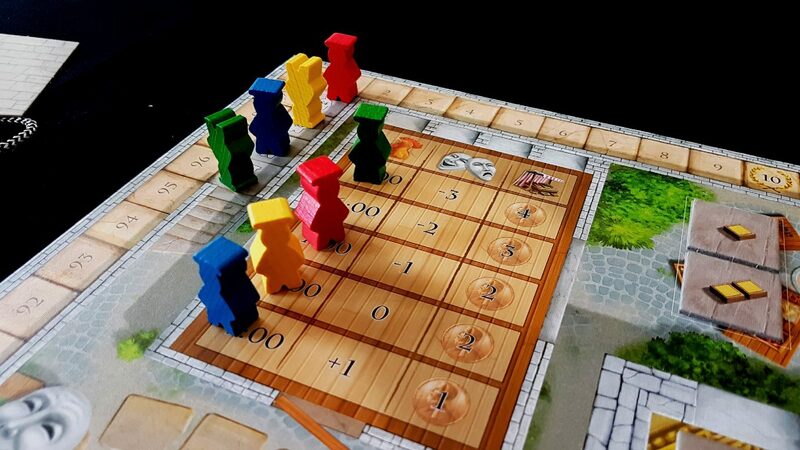 Fresco, through the erratic evolution of the game state, is one that more effectively allows players of mixed ability to play together. It’s freer and more forgiving, and the value of that shouldn’t be underestimated. If you already had Lords of Waterdeep, I think Fresco would be an unnecessary indulgence but not a futile acquisition. If you were torn between which of the two to get, I think Fresco would be a good choice. 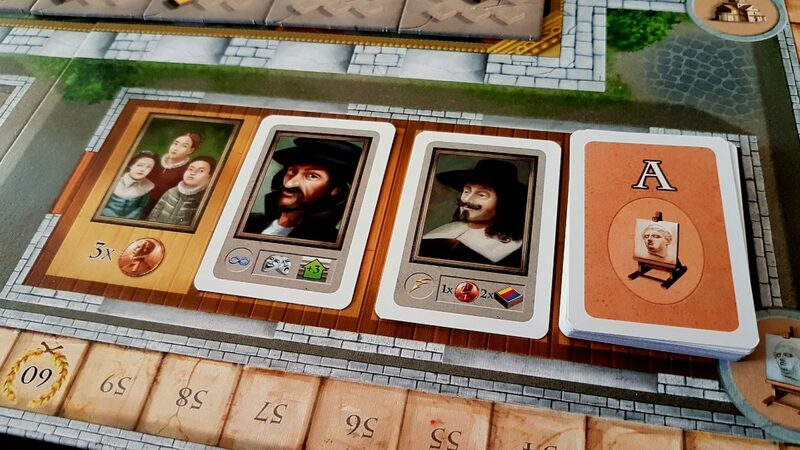 If you didn’t like Lords of Waterdeep, Fresco might offer you a different take on the experience that is similar, but meaningfully distinct. On the other hand, if you had Lords of Waterdeep and Skullport I think you’d find few reasons to choose to play Fresco. If price is no object, and mechanical overlap isn’t an issue, then sure – grab Fresco. I suspect you won’t regret it in the end even if you might spend your initial exposure fighting against your own first impressions. This is a game more endearing than its austere design might imply.